The main objective of this research work is to investigate the performance of automobile transmission gearbox under the influence of thermal properties variation of gearbox lubricant. An assumption has been made that the air-gear oil mist within transmission is under steady state condition, in isothermal equilibrium with the transmission gear oil bath of lubricant. The lubrication in multi speed transmission is subjected to thermo-elastohydrodynamic lubrication. The study here analyzed transmission in second gear pair. In full torque loading condition the high temperature generated due to meshing action of gears and frictional conditions between the transmission gear train changes the thermo-physical property of gear oil. The overall vehicle transmission gearbox performance is governed by the gear oil properties and it also effects the fuel consumption. This research study was performed at two higher different temperature range of gear oil.The analysis result shows that the gearbox oil thermal properties directly effect the performance and life span of automobile transmission gearbox. In vehicle transmission gearbox assembly gear oil is used as lubricant for cooling of gear train assembly and release the heat to cooling fluid of radiator. Gear oil can perform the cooling function at (-18 to 100)0C temperature. Gear oil provides good sealing, friction durability, antifoam and non-corrosive to gear train parts and internal components of gearbox casing. 4-speed transmission gearbox excluding reverse gear was studied for transient structural and thermal characteristics. 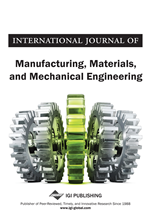 Researchers have performed various types of studies on transmission gearbox casing, gear train assembly, gear oil properties, role of gear oil for transmission efficiency and flow of lubricant in mini-micro channels heat exchangers. (Kumar and Patil, 2014) have studied the dynamic vibration problem of heavy vehicle truck transmission system. The simulation results were obtained for different looseness condition of transmission casing. Zero displacement constraint based boundary condition was applied by constraining all 37 bolt holes. The loose casing frequency varies from (1311-3110) Hz. (Karamavruc et al., 2011) have studied the heat transfer and fluid-flow characteristics of an automatic transmission fluid (ATF). They have investigated the thermo-physical properties of transmission fluid. Specific heat capacity, density, thermal conductivity and viscosity are the thermo-physical properties that highly depend on temperature. The viscosity of ATF is very important as it change in exponential manner with change in temperature but other thermo-physical properties shows linear relation with temperature. (Bozca and Fietkau, 2010) have studied the rattle noise problem in vehicle transmission by optimization of gearbox geometric design. Rattle noise is caused by torsional vibration transmitted from engine to the shaft of transmission. In experimental work the rattle noise were calculated by varying various parameters. The numerical, analytical work was also performed. (Zimparov, 2002) has studied the optimal design problem of the heat exchangers. The objective was to design a heat exchanger with minimum system losses. The entropy generation and irreversible friction flow problem was studied. (Salah et al., 2007) have investigated radiator heat exchanger, which is used for transmission oil cooling. The aim of study was to find a relation between transmission cooling and vehicle fuel economy. The results were in favor that if the transmission gear train cooling is proper and efficient, it increases the vehicle fuel economy. The results shows that improved use of ATF can reduce the fuel use by 1.0-1.4%. Quaiyum, (2012) has studied the Minichannel Heat Exchanger (MICHX) application. He studied the ATF cooling and flow behaviour. The wind tunnel based experimental setup was used for the micro channel analysis. ATF flow on a mini channel heat exchanger was studied for varying convective heat transfer coefficient and Reynold’s no. (Pennestri et al., 2012) have calculated the efficiency of epicyclic gear trains used in hybrid vehicles. They have also studied the power-flow in the transmission by using graph theory approach. (Kumar et al., 2015) have studied the transmission casing for different material application. A series of four materials were studied for vibration based suitability analysis. Vehicle transmission power-train thermo-elastohydrodynamic lubrication, dynamics, thermal balance, gear interaction and gear oil were studied (Cruz et al., 2012). Convective heat transfer co-efficient (h) measure how faster heat transfer takes place. The correlation shows that the h changes linearly with Reynold’s No. an exponent of 1.044 (Quaiyum, 2012). Transmission gear train components material properties were considered for dynamic analysis (Qin-man, 2011). In this study the effect of gear oil on thermo-mechanical performance was measured for high performance of multi speed transmission gearbox. The inclusion of convective heat transfer coefficient is essential in the study of multi speed transmission when dealing with increasing the transmission thermo-mechanical performance. Under isothermal conditions the temperature around transmission gear train was assumed throughout same as bath gear oil. Steady state, isothermal condition reduces the complexity of simulation when considering average convective heat transfer coefficient.